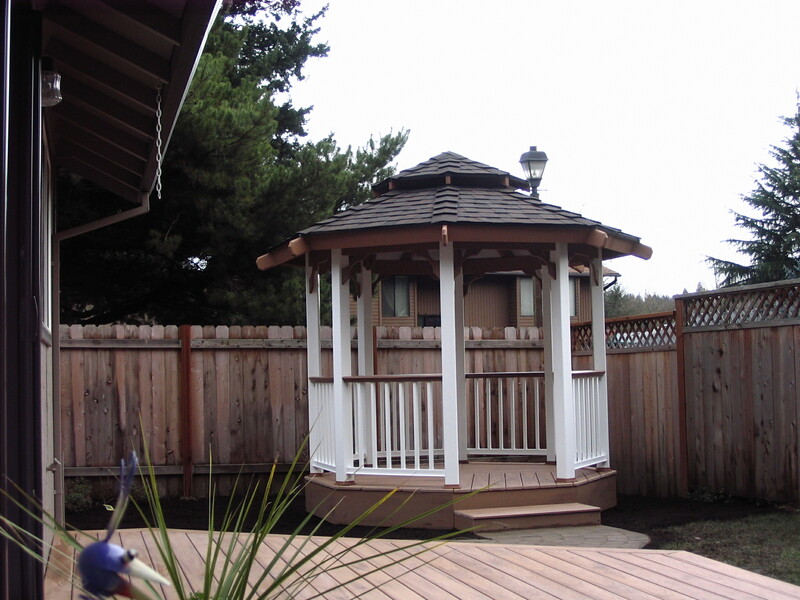 The Monarch Teak Gazebo Kit. The 10' monarch style Gazebo kit with the composition style roof and white railing using the Teak exotic hand rail system provides a wonderful contrast on a low maintenance no maintenance type gazebo. Teak Handrail and Decking Tigerwood Monarch side construction. 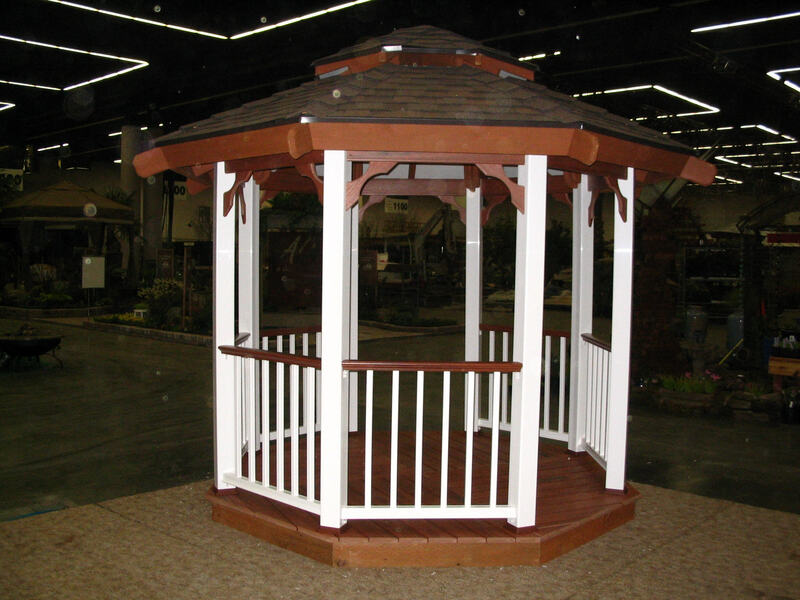 Our low maintenance gazebo is manufactured with Monarch's co- extrude/composite Exotics decking and railing system. We use the chameleon rail system using white balusters and a top handrail that matches the decking. This Gazebo can be ordered with or without the deck, It is normally installed on concrete deck blocks using a pt 4x4 to level ...( this is the customers responsibility to purchase at their local building store ). Our instructions do show you how to use them and where to place them. There is some assembling on site however everything is pre-cut to fit, and pre drilling is a must. This project will take approximately 8-10 hours to complete. The roof is constructed using 2x6 western red cedar and sealed with a 15yr solid stain to match the Exotics color palette. We use a 30 year architectural composition shingle and the high - rise ridge caps. The composite material used to manufacture this product is the result of advanced composite technology that delivers the look, fell and workability of wood, without the maintenance headaches. Monarch's patent-pending color process creates boards that are unique and one-of-a-kind ~ realistic in their color veining, shading and graining. Exotic's decking meets ADA standards for slip resistance. The Exotics and Chameleon railing system by Monarch is available in Five designer colors. White, Teak, Tiger wood, Mahogany, and Cypress. We have several options on our drop down list that you can choose from. If none of them fit your style then choose the E-mail us option and put a note in the optional instruction box at check out ( 30 character max. ) and we will contact you before we begin construction , we will also be in contact with you as to dock dates, and receiving timelines, etc.. Happy homeowners. Satisfied business owners. Successful contractors. 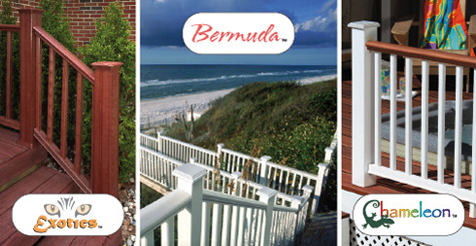 Monarch™ railing systems deliver more performance, visual appeal and value for every customer. Homeowners love the rich look, design flexibility and easy-care livability of Monarch products. 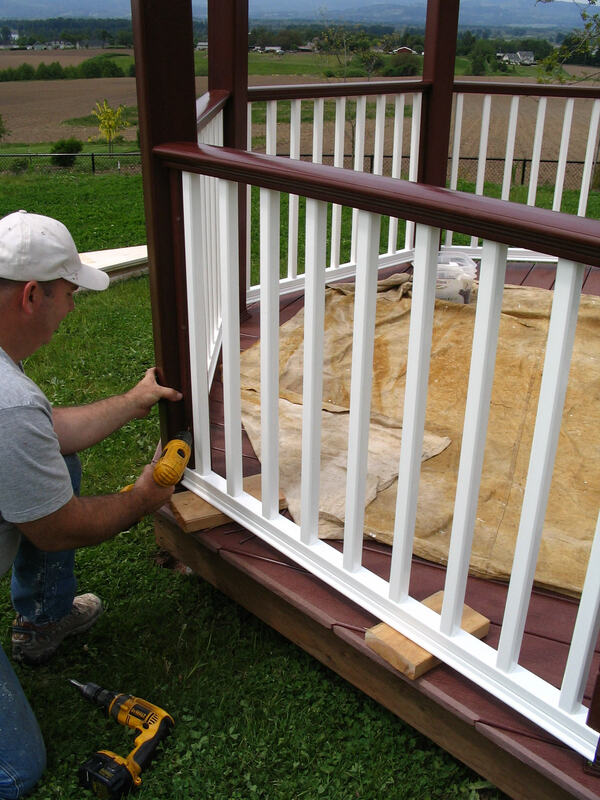 Contractors and DIYers appreciate their consistent high quality, wood-like workability and easy assembly. Offered in a wide array of popular styles, sizes and finishes, Monarch products redefine excellence at every level. Our patent-pending color process creates boards that are unique and one-of-a-kind. Now, the lasting beauty and drama of exotic hardwoods in a unique decking product that’s easy to install and even easier to maintain. Exotics™ decking is the result of advanced composite technology that delivers the look, feel and workability of wood, without the maintenance headaches. Our patent-pending color process creates boards that are unique and one-of-a-kind – realistic in their color veining, shading and graining. Exotics decking meets ADA standards for slip resistance.